Ice bars have become one of the most popular winter attractions here in the Saratoga area! Not only do they feature beautiful bars, seating, sculptures, and more all carved from ice, but visitors are able to enjoy delicious specialty drinks. Bellini's Italian Eatery in Latham will host an ice bar on January 30 and January 31. Tickets are $40 in advance and $50 at the door for the first night and include hors d'oeuvres, two cocktails, live music, and more. The second night will have no entry fee. The Mill on Round Lake will present their Fire & Ice Bar on Fridays and Saturdays during the first three weekends of February. Guests can look forward to the ice bar, ice shuffle board, ice corn hole, fire pits, hot chocolate cocktails, and more. 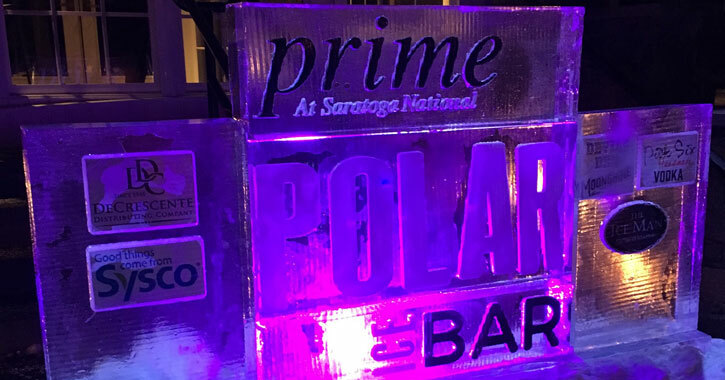 Head over to Prime at Saratoga National for the Prime Polar Ice Bar! The ice bar event will feature a three-sided ice bar, games, cash bar, cigars, and more. Grand Central Station will perform on Friday night, and The Radio Junkies will perform on Saturday afternoon. Tickets are available online for $20 per person, or $25 per person on the day of the event. Come out for Bailey's third annual ice bar! This is a full outdoor ice bar experience with tons of specialty martinis, hot chocolate, ice luges, games, music, and more. Head to The Cove on the Hudson for their second annual ice bar. Enjoy live music from the Open Bar Band from 12pm to 4pm, followed by David Clements 5pm to 8pm.